I’ve been posting bits of my forthcoming Getting Medieval with C S Lewis as they get written. Today I launch into a three-part section of the chapter on the medieval passion for theology. This whole section deals with the peak movement in medieval theology: scholasticism. Scholasticism is a much-misunderstood movement still covered with the mud of Enlightenment disdain (“All they did was sit around debating the number of angels that could dance on the head of a pin”). But its actual goals, development, and achievements lead us to some surprisingly modern applications. These take-aways for today have to do with the ways scholastic thinkers managed to hold together (not without tension and controversy) faith & reason, love & logic, religion & science, and Word and world, which will be the subject of the section following these three. As usual, all of this is still in draft stage, so you’ll see the sawdust and rough edges of the workshop. Although many areas and movements in medieval thought are worthy of study, this chapter will focus on scholasticism. “Scholasticism” just means “theology done in the schools.” The schools in question were “the monastic and cathedral schools of the eleventh and twelfth centuries—Bec, Laon, Chartres, Saint Victor, Notre Dame de Paris—and the universities of the thirteenth and fourteenth centuries—Paris and Oxford and the long line of their younger sisters.” Essentially, medieval scholasticism was the birthplace of systematic theology: the attempt to apply logical categories and modes of argumentation – especially Aristotelian dialectics – to the materials of Scripture and Christian tradition. Without getting bogged down in the details, it is important to get a sense of how this hugely influential movement happened. If we go right back to the beginning, we find in pre-Christian Greece and Rome a classical system of thought that sought, through the exercise of reason on philosophical principles and through the use of dialectic, the answers to why we’re here on earth and all of those important life questions. Once those answers were firmly found in Christ, there was a period of a few centuries represented by Clement of Alexandria, Justin Martyr, and other Christian philosophers of appreciating and syncretizing – not in a negative way – that classical knowledge and that classical quest with the new Christian information from the Judeo-Christian scriptures. The next milestone is Augustine of Hippo. In one sense, all of medieval theology, including scholasticism, was a series of footnotes on Augustine. The great North African, building on earlier apologists and theologians who had absorbed classical learning to the Christian framework (a move Wilken calls “the Christianization of Hellenism”), insisted that knowledge begins with faith and faith provides a foundation for knowledge. But it was many centuries after Augustine before scholasticism finally began to develop as a systematic, rational approach to faith. It arose in the context of what has been called the ‘making of Europe.’ Essentially, after classical society dissolved following the fall of Rome (which Augustine lived to see coming—and he wrote The City of God to address it), there came a rebuilding. At first, in the early Middle Ages (500 – 1000; still sometimes called the “Dark Ages”), this rebuilding was slow and piecemeal, as the patchwork social order of the feudal age took shape. However, by the 12th century Europe had become an organized international community, bound together by a common allegiance to the Roman Catholic Church. The stability provided to all of European culture by that overarching church was the missing piece. Back in the 4th century, the reign of Christian-friendly Emperor Constantine had given peace and social stability to Christians to do their theology in the context of the early councils. Here, at the height of the middle ages, we see a similar dynamic, this time under the stabilizing protection of the papacy, allowing a flowering not just of theology, but of all forms of learning. The next milestone toward a full-blown scholasticism was when the Holy Roman Emperor Charlemagne, the 9th century, insisted that cathedrals (major churches in cities—the “seats” of bishops) should run schools for the clergy that taught the liberal arts, Scripture, and the writings of the church fathers in a systematic way. As urban centers continued to grow through the 10th and 11th centuries, especially in France, so did the cathedral schools. As these urban centers expanded their citizens’ intellectual interests and social needs, the cathedral schools focused more and more on the liberal arts, differentiating themselves increasingly from the old monastic schools. The next milestone—what may be considered the “birth moment” of scholasticism, in fact—was what has been called the 12th-century renaissance, when a whole new intellectual atmosphere developed, largely in the cathedral and monastic schools that were to become the first universities of Europe. 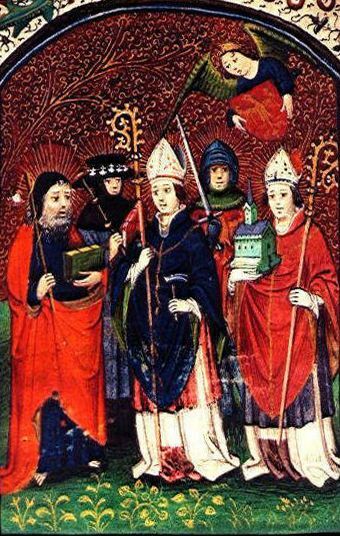 In the late 11th century, a critical mass of both cathedral and monastic schools began to develop, and more and more brilliant and ambitious young men flocked to them from all over Europe, studying together in their common language, Latin. This laid the groundwork for the 12th-century evolution of some of the cathedral school into the university. This was the precocious educational child of the church that, many centuries hence, would begin to eat its parents—but nobody knew that yet. At this stage, the university was compelled by the powerful impulse we have been describing: to dutifully exercise the power of reason, which is a gift of a good God, to explore God’s creation in ways that delight and illuminate the mind, feed the spirit, and increasingly, benefit humanity in more tangible ways, as science began to birth technological advances. The new interest in the scientific exploration of the universe arose in Europe especially as Aristotle’s lost scientific works were rediscovered in the West in Arabic translations (with whom Europeans came into contact through commerce and urbanization) and in Greek works from the East. In the Greek philosophers, particularly the scientific and metaphysical works of Aristotle, Christian thought was confronted with a new and comprehensive philosophical and scientific worldview. 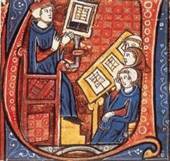 As a result, the developing universities worked with a wider range of knowledge than the earlier monastic and cathedral schools. The stage was set for the full flourishing of the scholastics, who as we’ll see appropriated the methods and modes of discourse of the sciences for their own theological purposes. –Peter Lombard (1095-1152), who created the first textbook of systematic theology, the Sentences, and taught in that book both that when the believer loves, he or she is by that love actually taken up into the life of the Trinity—a novel teaching that never caught on, and that marriage was consensual and did not need to be consummated to be considered perfect—a novel teaching that later won the day. A word more on Lombard’s Sentences: it was the theology textbook that everyone in medieval Western Europe used—and that every significant theologian eventual wrote a commentary on. It was also the first book (really four books) arranged in the now-familiar topical pattern of systematic theologies, with each topic and subtopic supported with quotations from the church fathers. Before we continue, it is important to note that not every theological thinker was so taken by this new “scientific” approach. Scholastic theology was not the only game in the Middle Ages: Benedictine monasticism, born in the 7th century and harnessed to the educational task under Charlemagne in the 9th, created not only some of the root conditions for scholasticism, as we’ve seen, but also a continuing parallel stream of Christian thought throughout the scholastic period—a stream sometimes in significant tension with scholasticism, as we’ll see. Inasmuch as Benedictine monasticism was an intellectual movement – and it was really not a movement primarily for learning, at least not for secular learning – it was a movement for attending to, listening to, hearing God in a way that we might call spiritual theology. So when Abelard pushed the claims of dialectic within theology, Cistercian monk Bernard of Clairvaux, himself a great intellect and quite capable of slinging syllogisms with the best of them, objected that the hot-headed young scholastic was endangering the piety of the church, and he pursued him relentlessly through the political machinery of the church hierarchy. Undeterred, the masters of theology in the schools continued to be so impressed by the categories of rational analysis used to understand natural phenomena that they imported these categories into doctrine and theology. Thus, you could actually find in theological works of the time the title “On Transferring Terms from the Study of Nature to Theology.” Much of this effect of science on theology had to do with the rediscovery of Aristotle’s works. K S Latourette: “The first treated of God, His nature, the Trinity, the attributes of God, and predestination. The second was devoted to God’s creation, including angels, but principally, man, sin, free-will, and the need of redemption. The third dealt mainly with the work of redemption through Christ. The fruits of the Spirit were covered, and the seven cardinal virtues. The fourth book was chiefly concerned with the sacraments and eschatology.” History of Christianity, 506. This entry was posted in Medieval Wisdom for Modern Protestants and tagged Anselm of Canterbury, Aristotle, Augustine, Charlemagne, faith and reason, Middle Ages, Peter Abelard, Peter Lombard, reason, scholasticism, the university, Theology, Thomas Aquinas, universities. Bookmark the permalink.